High Notes - Improve them! Do you want to sound better, and have beautiful music flow out of your clarinet? Do you want better tone quality? Faster fingers? Effortless, flexible tonguing and articulation? Do you need help figuring out how to even get started on the music that you would like to play? Have you been told that you are too old, or too “unmusical”, or too (fill-in-the-blank), to play a musical instrument well? Would you like to feel more confident in your own abilities to quickly improve your skills on the clarinet and perform well? My name is Michelle Anderson, and for 30 years I have been performing professionally and teaching students of all ages to find easier ways to play the clarinet. My favourite group of people to teach are enthusiastic adults who are drawn to the clarinet because they love how it sounds. They usually have a song or two in mind that they wish to master. Many of them are returning to the instrument after a long break from playing. Many are starting as beginners, to learn a new instrument, or to play their first instrument ever. I love working with adults because they are smart enough to grasp sophisticated concepts quickly. If you have a good understanding of what makes the instrument easier to play, it really will be easier for you to learn. I have been honing my teaching systems for years, and now I find that my own students are demanding more. They want resources that they can use at home to continue the great work that we have done in lessons or workshops together. I am now making these resources available to interested clarinetists all over the world. 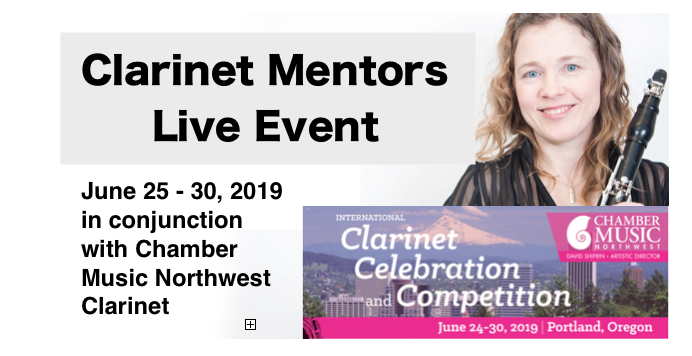 When you join the Clarinet Mentors community, you can immediately access some of the complimentary resources that are available through my website and our popular e-newsletter. The newsletter comes every two weeks, and always contains a short educational article or video that you can use to improve your own clarinet playing experience immediately. You will also be the first to hear about other available resources such as home-study courses, teleseminars and lessons. If you sign up for our newsletter, you will get some great clarinet pointers delivered to your inbox within 2 weeks. Here’s a video of me doing some of the performing that I enjoy best. The first video features the first movement of the Tichelli Clarinet Concerto which I performed in the summer of 2015. The second video is an an excerpt of Brooklyn Bridge, by Michael Daugherty, for clarinet and wind ensemble from March of 2011. I was privileged to perform both of these pieces with my friends and colleagues of the Pacific Symphonic Wind Ensemble.